This 9x12, 350 page art book is a stunning collaboration of contemporary visionary art and mystical writings from an assortment of spiritual traditions. 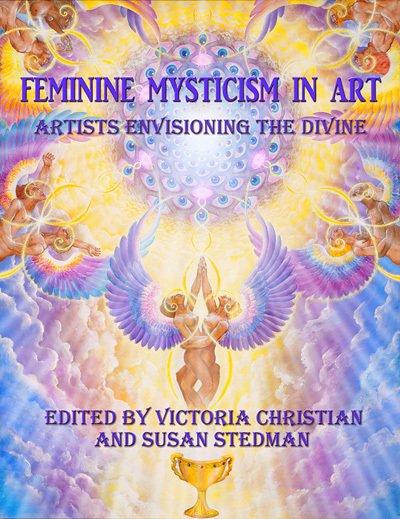 After ten years of hard work, Feminine Mysticism in Art: Artists Envisioning the Divine has evolved into an epic collaborative effort--one that has the potential to go down in history as a "must have" book for art lovers and mystics from an assortment of disciplines. The book includes over 65 contemporary visionary artists. The artwork alone is unique, exquisite, political and provocative, communicating a message of hope for the postmodern era. In addition, the diversity of writings by experts in women's spirituality, mysticism, eco-feminism, transcendental art and transpersonal psychology provide a conceptual foundation for the images. Now is your chance! For the first time, the world’s best visionary artists have been gathered together in one epic collection. See Beyond the Veil…into alternate visions of reality and the continual exploration of consciousness. From lucid dreams to deep visions and meditations, these artists part the veil of perception and present a new paradigm for the evolution of our world. Get your beautifully printed hardbound or softcover book today and dive in … your world will never look the same!